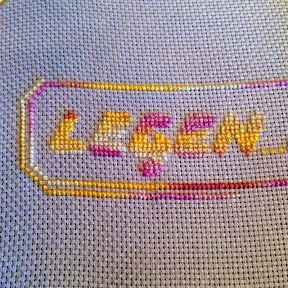 Been steadily stitching away on the border for Legendary, I am using Dinky Dye thread for the first time and they are beautiful. So silky and it glides through the fabric. Next update on this should be a finish, yiphee !!! Ooooh....lovely colours. I just received my first ever dinky dyes thread and can't wait to use it as it feels so wonderfuly soft. I love the colours on the variegated thread, it makes for a really interesting effect. A Finish and More Legendary !! !